Join us for this Costa Rica Travel where you expect unique moment, this is a new and different recommendation that Travel Excellence brings you today is the Savegre Hotel in San Gerardo de Dota. 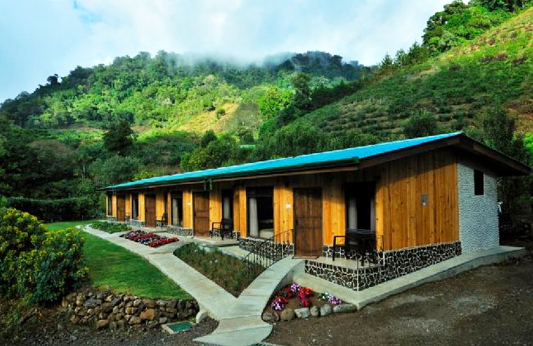 In this mountain hotel guests will find a dense cloud forest full of oaks and other native species. The woods serve as a sanctuary for a large number of mammals and innumerable species of insects, amphibians, plants and colorful birds, a paradise for birdwatchers. This remarkable hotel has two room categories: 21 standards nestled in the middle of beautiful gardens and 20 junior suites recently renovated. All rooms have telephone, coffee maker, safety box and hair dryer. The restaurant Las Bromelias, offers buffet-style meals, which you can also enjoy a la carte, include a wide variety of cuisines… don’t miss the chance to try their specialty - a rainbow trout freshly caught from the Savegre River. The hotel is managed by the Chacon family, who arrived in 1954 and Savegre were the pioneers of this valley. And it is important to mention that this hotel has a biological reserve and also has 180 species of birds that have been observed in the area and the many trails in the cloud forest. This is known as one of the best places to observe quetzals. About San Gerardo de Dota: Is located only 85 kilometers southwest of the capitol on the Pan-American Highway, a natural territory for many species of flora and fauna, and establishes an ecological role where the vivid quetzal lives throughout the year. The incomparable beauty of the highland scenery offers the unique opportunity to experience the sounds and secrets of the tropical cloud forest and to discover the wonders of the Costa Rican ecology. San Gerardo de Dota is within the largest extension of protected areas of the country, an area made up of 13 different units which together total 95,000 hectare. We exceedingly suggested this tourist place to nature lovers.